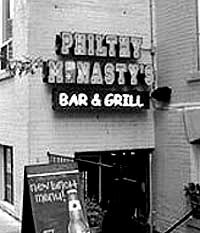 "I was working at the Philthy McNasty's on King St. downtown for a couple years, and I would regularly close. Closing would keep me there until 4am sometimes because of the clean up. There was always at least 3 people that stayed til the end. For anyone who has not been in this bar, there is a square shaped bar about 3 or 4 feet from the kitchen wall with a 'servers walkway' in between. on either side of this walkway are saloon type doors to the kitchen. Attached to the bar near the front of the restaurant is a smaller bar (towards Duncan St.).From the time I started working there, certain parts of the restaurant gave me the creeps. The girl's bathroom, the server's walkway, and the back corner of the smaller bar. I always just amounted these fears to me being paranoid. I tend to scare easily so I would push these thoughts out of my mind and just do my work as quick as I could. I worked with my boyfriend and my brother most nights, so I would ask them to help me so I wasn't alone. One night, we were closing and I was just wiping down the bar in the server walkway. Out of the corner of my eye, I saw someone rush by and into the kitchen, almost angrily. I assumed it was my brother because it seemed to come from the direction of the office and head into the kitchen, and he often had a short temper with the management. So I went into the kitchen to ask him what was wrong, but no one was in there. The kitchen door was swinging so I stopped it and continued to call for my brother. I figured he either went out the back stairs to cool down or something,so I headed to the office to see if I could find out from the manager what was wrong. As I walked towards the office, I passed the bathrooms. Just as I passed them, my brother walked out and asked if I was almost done. I explained what just happened and he told me that he had been in the bathrooms cleaning them for the last 20 mins. At this point I was kind of creeped out. There was only me, him and the manager there. We went to talk to manager, and she was busy doing office work. So we went to check the kitchen in case a drunk had stumbled in or something. The back door was locked, and the kitchen was empty.At this point, I realised that the saloon doors had been swinging; the set on the right that was broken. I know they were swinging because I stopped them. The door I stopped doesn't swing because it is missing a hinge; so it just hangs. The next weekend, I am closing again, and I can feel someone standing beside. I had been joking around all night with the manager about some losers that I served. I assume it is my manager, so I start talking and while I work. I talk a lot, so I talked for a good minute or so before I realised she wasn't answering. So I turned to see her and there was nothing there. I told myself it was probably nothing. About an hour later, I was just about to leave, and I thought I saw someone standing in the corner of the smaller bar. I bolted to the office and got my manager. I tried researching all of this, but the building used for many different things over the years, so I couldn't find much. An employee at the sandwich shop next door said they saw the same woman figure. They claimed it was from the antique shop above our stores but didn't know much more about it."